Scroll for the video. And definitely do not try this at home. As we're about to slide into the Thanksgiving holiday here at Gentedimontagna HQ in New York City, our Japanese friends are busy sliding down stairs. Not just any stairs. Slippery Stairs. We don't know much about this Japanese game show other than that it's exactly what its name implies. 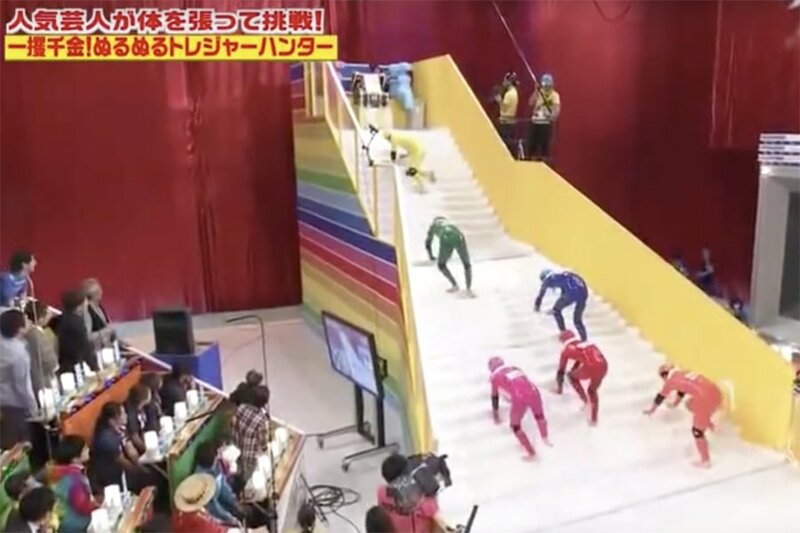 What we absolutely do know is that watching six men in rainbow-hued bodysuits and helmets try to climb a very challenging staircase is easily the funniest and most ridiculous thing we've seen since, well, maybe . No wonder this clip is tearing up the internet. Behold, the tenacity of the athletes. The thrill of grip. The agony of the slide. The motivational Indiana Jones soundtrack. Oh, the sheer Sisyphean spectacle of it all. Why not suggest that your family try this after Thanksgiving dinner? Tell them it's an ancient tradition you picked up on your last trip to Kyoto. Our obsession with all things Japanese rages on. Keep exploring things that are almost too good to be true, like and .